been preserved. Residents still frequent general stores, town meetings, seasonal festivals and church suppers. many make a living operating businesses out of their homes and by farming, logging, and sugaring. This traditional culture is reflected in the area’s farms and woodlands, village commons, and fine early New England, Greek Revival and Victorian style buildings. The Heart of Vermont Chamber of Commerce serves communities of nearly 8,800 residents and 400 businesses. The Chamber represents eight towns: Hardwick, Stannard, Walden, Wolcott, Craftsbury, Greensboro, Cabot and Woodbury. The unique characteristics of each town are derived from the rich history of the area. Many of the towns were founded along the Bayley Hazen Road, which was built during the Revolutionary War period. This road cleared the way for settlers from New Hampshire, New York and Connecticut. It wasn’t until 1777, when Vermont declared its independence as a republic, that the state was considered a separate entity, as opposed to an extension of New York or New Hampshire. Four years later, most of the Hardwick area towns were chartered; and in 1791, Vermont became the 14th state in the union. Today the essence of old-time Vermont is still evident in the historic placards and buildings that bear the names of important citizens. Stories about early settlers, Civil War heroes, and intrepid farms, loggers and entrepreneurs haven’t been forgotten. The area’s historic villages and the unsurpassed beauty of its open farmland, streams, foothills and mountain views draw tourists – no matter what the season. The lakes, rivers and woodlands teeming with wildlife. 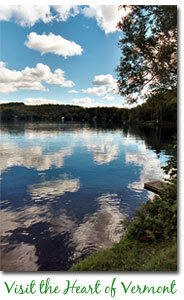 Enjoy art, music, hiking, hunting, fishing, snowmobiling, cross-country skiing, bird watching or just relaxing.